American pilot astronaut 1966-1991. Member of first crew to fly a winged spacecraft to orbit and back. Status: Inactive; Active 1966-1991. Born: 1937-09-11. Spaceflights: 4 . Total time in space: 23.57 days. Birth Place: Beaumont, Texas. Grew up in Porter, Texas. Educated Texas. US Navy test pilot. PERSONAL DATA: Born in Beaumont, Texas, on September 11, 1937. Married to the former Pandora Lee Puckett of Miami, Florida. Three grown daughters. EDUCATION: Graduated from New Caney High School in Caney, Texas; received a bachelor of science degree in Aerospace Engineering from the University of Texas in 1960. ORGANIZATIONS: Fellow, American Institute of Aeronautics and Astronautics; American Astronautical Society; and Society of Experimental Test Pilots. SPECIAL HONORS: NASA Outstanding Leadership Medal (1988); Distinguished Service Medals (1985, 1988, 1993); U.S. Navy Distinguished Flying Cross (1984); Defense Meritorious Service Medal (1984); Federal Aviation Administration's Award for Distinguished Service (1982), Goddard Memorial Trophy (1982), Harmon Trophy (1982); NASA Space Flight Medals (1981, 1983, and 2 in 1984); NASA Distinguished Service Medal (1981), Department of Defense Distinguished Service Award (1981); American Astronautical Society Flight Achievement Award (1981); National Geographic Society's Gardiner Greene Hubbard Medal (1981); Aviation Hall of Fame 1981 Al J. Engel Ward; American Legion's Distinguished Service Medal (1981), Society of Experimental Test Pilots Ivan C. Kincheloe Award (1981); NASA Exceptional Service Medal (1972). EXPERIENCE: Crippen received his commission through the Navy's Aviation Officer Program at Pensacola, Florida, which he entered after graduation from the University of Texas. He continued his flight training at Whiting Field, Florida, and went from there to Chase Field in Beeville, Texas, where he received his wings. From June 1962 to November 1964, he was assigned to Fleet Squadron VA-72--completing 2 1/2 years of duty as an attack pilot aboard the aircraft carrier USS INDEPENDENCE. He later attended the USAF Aerospace Research Pilot School at Edwards Air Force Base, California, and upon graduation, remained there as an instructor until his selection in October 1966 to the USAF Manned Orbiting Laboratory Program. Crippen was among the second group of aerospace research pilots to be assigned to the MOL program. He has logged more than 6,500 hour flying time, which includes more than 5,500 hours in jet aircraft. NASA EXPERIENCE: Crippen became a NASA astronaut in September 1969. 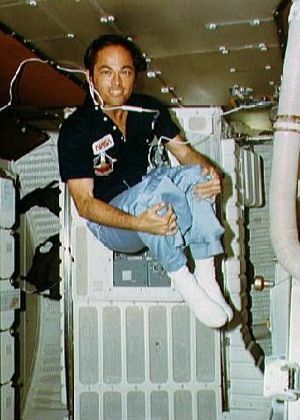 He was a member of the astronaut support crew for the Skylab 2, 3, and 4 missions, and served in this same capacity for the Apollo-Soyuz Test Project (ASTP) mission, which was completed successfully in July 1975. He served as pilot on STS-1 (April 12-14, 1981), and was the spacecraft commander on STS-7 (June 18-24, 1983), STS-41C (April 6-13, 1984) and STS-41G (October 5-13, 1984). A four flight veteran, Crippen has logged over 565 hours in space, orbited the earth 374 times and traveled over 9.4 million miles. Positions held include: 1986-1989 deputy director, Shuttle Operations, for NASA Headquarters at Kennedy Space Center, Florida, responsible for final Shuttle preparation, mission execution, and return of the orbiter to KSC after landing at Edwards Air Force Base, California; 1990-1992 served as director, Space Shuttle, at NASA Headquarters in Washington, D.C., where he presided over the overall Shuttle program requirements and performance, and total program control including budget, schedule, and program content. 1992-1995 he managed Kennedy Space Center processing, launch, and recovery of Space Shuttle missions, ending a 21 year NASA career in January 1995 as the Director of the Kennedy Space Center. He next served as vice president of Training Simulation Systems at Lockheed Martin Information Systems. In December 1996 he became President of the Thiokol Propulsion Group, Brigham City, Utah. This newly established Group was composed of three divisions, Space Operations, Defense and Launch Vehicles, and Science and Engineering. Crippen retired in April 2001 as President of Thiokol Propulsion. STS-7 (June 18-24, 1983) was the second flight for the Orbiter Challenger. This was also the first mission with a 5-person crew. During the 6-day flight the crew deployed satellites for Canada (ANIK C-2) and Indonesia (PALAPA B-1); operated the Canadian-built Remote Manipulator System (RMS) to perform the first deployment and retrieval exercise with the Shuttle Pallet Satellite (SPAS-01); conducted the first formation flying of the orbiter with a free-flying satellite (SPAS-02); carried and operated the first U.S./German cooperative materials science payload (OSTA-2); and operated the Continuous Flow Electrophoresis System (CFES) and the Monodisperse Latex Reactor (MLR) experiments, in addition to activating seven Getaway Specials. Mission duration was 146 hours, 23 minutes, 59 seconds. STS-41C (April 6-13, 1984) was a 7-day mission during which the crew successfully deployed the Long Duration Exposure Facility (LDEF); retrieved the ailing Solar Maximum Satellite, repaired it on-board the orbiting Challenger, and replaced it in orbit using the robot arm called the Remote Manipulator System (RMS); flight tested the Manned Manneuvering Units (MMU's) in two extravehicular activities (EVA's); as well as operating the Cinema 360 and IMAX Camera Systems, and a Bee Hive Honeycomb Structures student experiment. Mission duration was 167 hours, 40 minutes, 07 seconds. STS-41G (October 5-13, 1984) was the first mission with a 7-person crew. During the 8-day flight the crew deployed the Earth Radiation Budget Satellite, conducted scientific observations of the earth with the OSTA-3 pallet and Large Format Camera, as well as demonstrating potential satellite refueling with an EVA and associated hydrazine transfer. Mission duration was 197 hours, 23 minutes, 37 seconds and concluded with a landing at Kennedy Space Center, Florida. NAME: Robert L. Crippen (Captain, USN), pilot. BIRTHPLACE AND DATE: Born in Beaumont, Texas, on Sept. 11, 1937. He grew up in Porter, Texas, where his mother, Mrs. Herbert W. Crippen, now resides. PHYSICAL DESCRIPTION: Brown hair; brown eyes; height: 5 ft. 10 in. : weight: 160 lb. EDUCATION: Graduated from New Caney High School, Texas; received a bachelor's degree in aerospace engineering from the University of Texas in 1960. MARITAL STATUS: Married to the former Virginia E. Hill. Her parents, Mr. and Mrs. James D. Hill, reside in Corpus Christi, Texas. CHILDREN: Ellen Marie, June 14, 1962; Susan Lynn, Dec. 24, 1964; Linda Ruth, May 10, 1967. SPECIAL HONORS: Awarded the NASA Exceptional Service Medal and the Johnson Space Center Group Achievement Award (1972). EXPERIENCE: Crippen received his commission through the Navy's Aviation officer Program at Pensacola, Fla., which he entered after graduation from the University of Texas. He continued his flight training at Whiting Field, Fla., and went from there to Chase Field in Beeville, Texas, where he received his wings. From June 1962 to November 1964, he was assigned to Fleet Squadron VA-72 -- completing two-and-one-half years of duty as an attack pilot aboard the aircraft carrier USS INDEPENDENCE. He later attended the U.S. Air Force Aerospace Research Pilot School at Edwards Air Force Base, Calif., and, upon graduation, remained there as an instructor until his selection in October 1966 to the USAF Manned orbiting Laboratory Program. Crippen was among the second group of aerospace research pilots to be assigned to the MOL Program. He has logged more than 4,275 hours flying time, which include more than 4,090 hours in jet aircraft. NASA EXPERIENCE: Crippen became a NASA astronaut in September 1969. 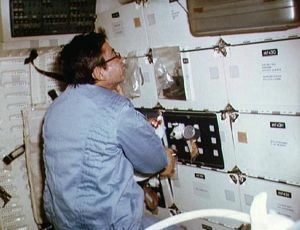 He was a crew member on the highly successful Skylab Medical Experiments Altitude Test (SMEAT) -- a 56-day simulation of the Skylab mission, enabling crewmen to collect medical experiments baseline data and evaluate equipment, operations and procedures. 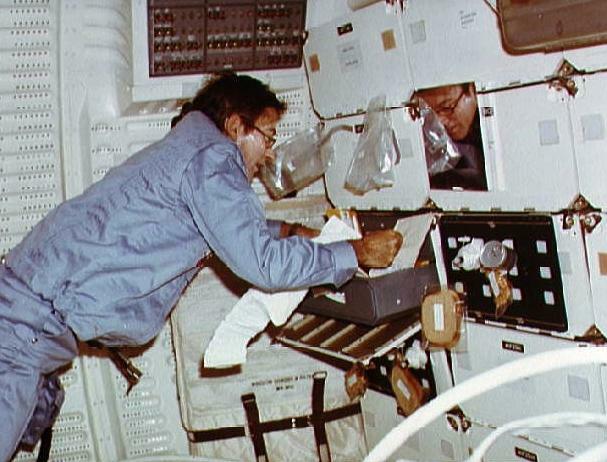 Crippen was a member of the astronaut support crew for the Skylab 2, 3 and 4 missions, and he served in this same capacity for the Apollo Soyuz Test Project (ASTP) mission which was completed successfully in July 1975. CURRENT ASSIGNMENT: Crippen has been designated pilot for one of the four two-man crews selected to fly Space Shuttle orbital flight tests and, with John W. Young, will fly STS-1 in 1981. Family: Astronaut. Country: USA. Flights: MOL 6, STS-1, STS-7, STS-41-C, STS-41-G, STS-62-A. Projects: STS. Agency: USN. Bibliography: 12, 5291. 1937 September 11 - . Birth of Robert Laurel 'Bob' Crippen - . Nation: USA. Related Persons: Crippen. 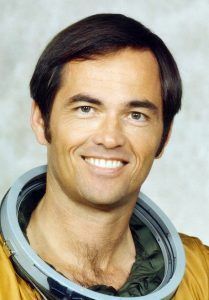 American pilot astronaut 1966-1991. Member of first crew to fly a winged spacecraft to orbit and back. 4 spaceflights, 23.6 days in space. Flew to orbit on STS-1 (1981), STS-7, STS-41C, STS-41G..